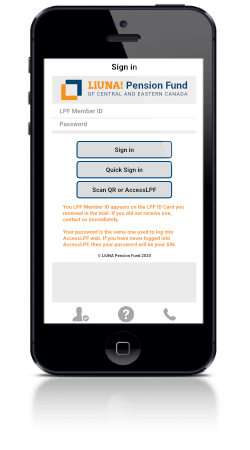 The LPFCEC Mobile App was designed to provide you with secure access to your LPF information. Update personal information , review contributed hours, get pension estimates and projected pension estimates and access Annual Pension Benefit Statements – all from your smart phone or tablet – anytime, anywhere! View all the contributions remitted on your behalf by your employer(s) listed by year. View your Annual Pension Benefit Statements issued by the LPF and listed by year. Estimate your current benefit based on your selected retirement age. You can also do a Projected Estimate based on your input of Projected Annual Hours and Projected Annual Rate Increase. View and Edit your address and contact information currently on file at the LPF. View the list of your designated beneficiaries that LPF has on file. The app can be installed on any version of the iPhone or iPad as long as the device has Apple’s operating system version OS5 or later. To check the operating system version of your device please go to: Settings -> General -> About , and view the line titled Version. Enter your LPF Member ID. This number is the LPF Member ID number printed on the LPF Member ID Card you received in the mail. If you did not receive your LPF Member ID Card, please contact us immediately. Your password is the same one used to log into AccessLPF. If you have never logged into AccessLPF, your password will be your SIN. After you have logged in for the first time, you can now use the Quick Sign In button whenever you wish to use your app. The login screen also has a “Scan QR on AccessLPF” button that allows you to log into AccessLPF’s website without manually entering the User ID and password on the web login screen. When this button is pressed, the mobile phone’s camera is activated and ready to capture the QR code which appears on the AccessLPF login screen. When you press this button on your phone, it will go into camera mode. Simply hold your phone in front of this QR code and the system will sign you in. You cannot change your password using the Mobile App. If you want to change your password you must log into AccessLPF on your computer. You will be prompted to create a new password immediately after logging in. Your new password must be between 8 and 20 characters long, include at least one letter and at least one digit or special character (ex: !,?,# etc.). Your password cannot contain your last name, first name or user name. Please remember that your saved password is case sensitive. If you forget your password, contact the LPF office, or use the AccessLPF “Forgot your Password?” feature on your computer. From any Android device, start "Play Store" app. to go to the Android Store. Once found, select it and click on the "Install" button. Read permission requirements, then if agree, click on "Accept and Download" button. The app will be installed and you can start it from the icon created on your screen. You cannot change your password using the Mobile App. If you you want to change your password you must log into AccessLPF on your computer. You will be prompted to create a new password immediately after logging in. Your new password must be between 8 and 20 characters long, include at least one letter and at least one digit or special character (ex: !,?,# etc.). Your password cannot contain your last name, first name or user name. Please remember that your saved password is case sensitive.